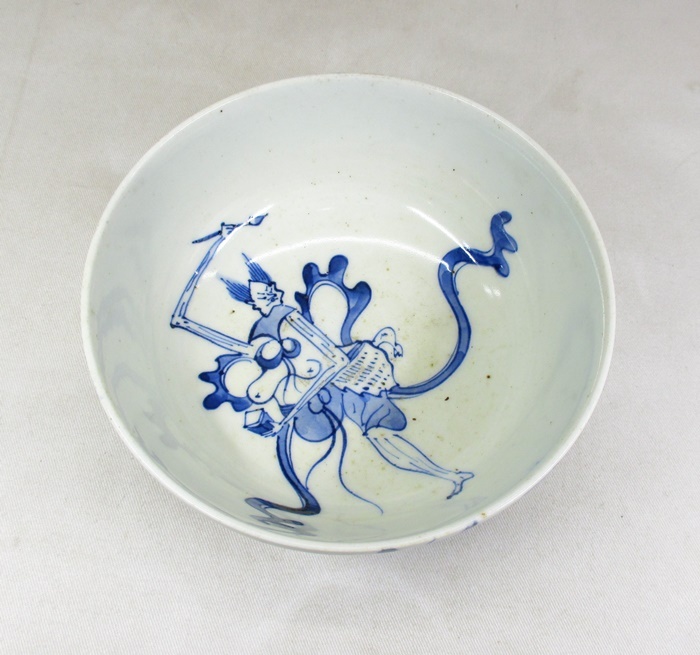 Can anyone identify what or who the image is inside of this bowl and who made it. 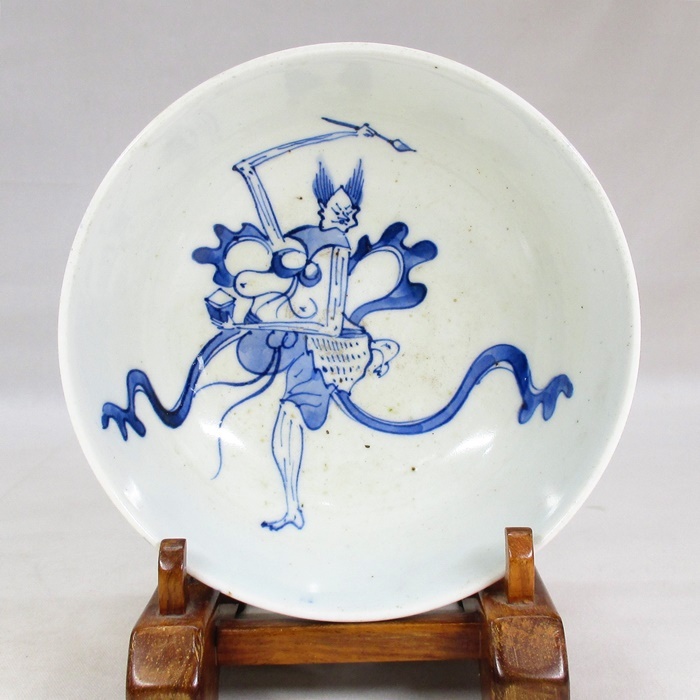 Supposed to be an old Seto pottery from late Edo period. The painting is superbly done. There is no visible mark. It's about 6" wide and 3" tall. Thanks for your help. This would seem to be the Chinese God of Literature, Wenchang Wang (文昌王) also simply called 'Wenchang' in that language. I'm unsure what the name might be in Japan. 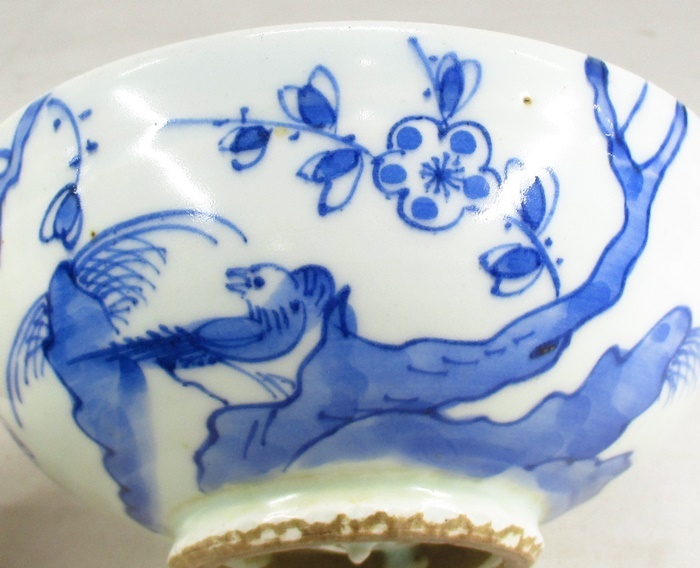 I've added an image of him found on a small 19th century Chinese pedestal dish. It shows him riding the legendary carp in the midst of transforming into a dragon, emblematic of students aspiring to make their leap over the waterfall of examinations to become a dragonly scholar in the Imperial Bureaucracy. 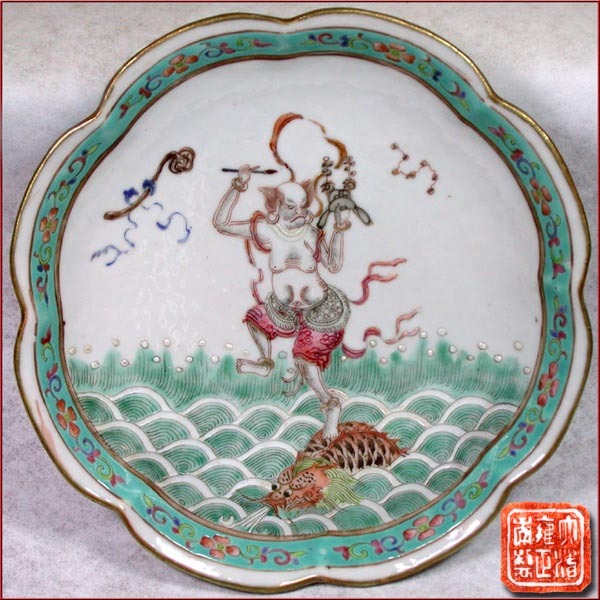 Here the God holds a Scholar's brush and hat, while an imperial "ruyi" scepter and the astrologically important Big Dipper loom prominently in the heaven above. Such a piece might have been a gift for an aspiring young scholar facing his final exams. from "Great Star of the Literary God"
For many centuries, Chinese scholars provided offerings to and prayed for favors from a deity that was known to be supportive of an intellectual, literary, or scholarly lifestyle. One "Literary God" is Wen Chang, who is often pictured with his two supernatural subordinates: an ugly fellow named K'uei Hsing (Kui Xing) who assists his supplicants in passing examinations and in earning degrees and diplomas, and a second fellow named Chu Yi (Red Coat) who assists scholars in finding good jobs. Both, Wen Chang and K'uei Hsing were thought to live in a mansion in the Big Dipper portion of the constellation Ursa Major. Another deity that is sometimes associated with scholars is the God of War, the patron saint of martial artists, Guan Di. One legend about K'uei Hsing (魁星 Kui Xing) is that he was a brilliant student, an outstanding scholar, and received the highest score on the Imperial examinations, but had problems. If you scored the highest on the Imperial examinations, then you were awarded a golden rose. K'uei Hsing was, unfortunately, extremely ugly and a handicapped dwarf. One story says that the Emperor was so repulsed by K'uei Hsing that he dropped the golden rose and it broke into pieces, another story says the Emperor refused to give the golden rose award to the scholar. In either case, K'uei Hsing was, of course, extremely disappointed and became despondent. While traveling, it is said that he fell or jumped into the ocean or river from a boat. A sea dragon or one legged sea monster rescued him and then escorted Kui Xing up into the Heavens, where Kui Xing took up residence with Wen Chang in the Big Dipper part (asterism) of the Ursa Major Constellation. Their heavenly abode is in the square part of the Big Dipper.